Irene’s eye and peak intensity are now about 9 hours away, and most of NYC is either sleeping or regretting that third 16 oz hurricane. The latest National Hurricane Center forecast (11 pm) calls for the center of Irene to pass right along the New Jersey coast as a Category 1 Hurricane (75 mph winds) and make landfall around the eastern boroughs of NYC at about 10:00 AM on Sunday August 28th. Fortunately, this is two hours after high tide at NYC’s coastal sites and The Battery. However, due to large storm area with strong winds, the peak storm surge for NYC will still merge somewhat with the morning high tide, and this could add as much as 2.5 feet of water to the surge. NHC forecast track for Hurricane Irene, including the storm surge heights that have a 33% likelihood of being exceeded (from NOAA's P-SURGE). Courtesy of Dr. Nickitas Georgas. NOAA’s storm surge model (P-SURGE) is a useful system for hurricanes with uncertain storm track and winds — it uses many possible weather forecasts instead of just one for the forcing of its storm surge model, so gives a broader perspective than a single forecast. 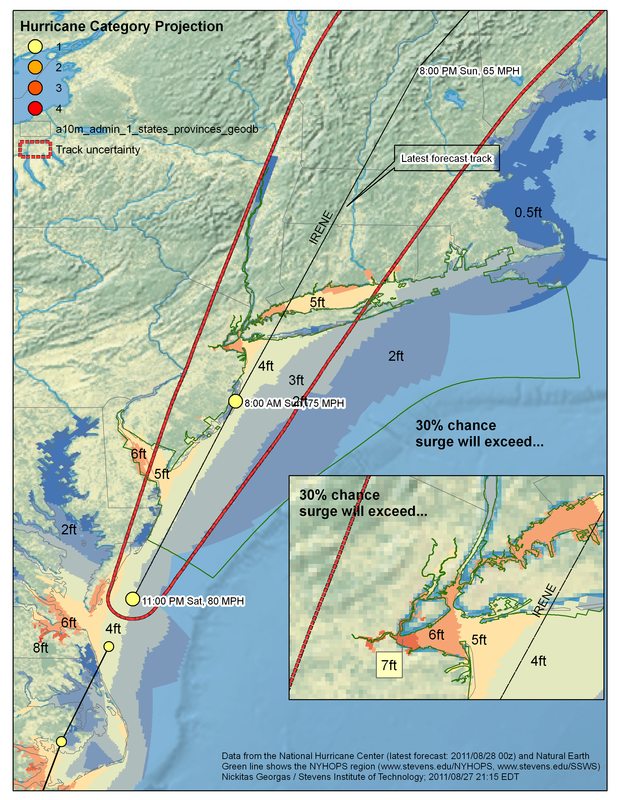 P-SURGE results suggest a probability of a 4+ ft storm surge for New York City’s inland waterways are about 75%. If added on top of the morning high tide, this water level will lead to overtopping of seawalls around the New York City inland waterways, and flooding of low-lying infrastructure (subways, PATH train, tunnels, FDR highway, etc.). They list the probability of a more devastating 8+ foot surge at 5%, though higher around Staten Island and inside Raritan Bay. This is in addition to expected heavy rainfall, which will merge with the storm surge some in low-lying areas. MORE SO THAN WITH MOST STORMS…THE WINDS WITH IRENE INCREASE SHARPLY WITH HEIGHT ABOVE THE SURFACE. AS IRENE MOVES THROUGH AREAS WITH HIGH-RISE STRUCTURES…THESE STRUCTURES WILL EXPERIENCE WINDS SIGNIFICANTLY STRONGER THAN INDICATED BY THE ADVISORY INTENSITY. WINDS AT THE 30-STORY LEVEL WILL LIKELY BE 20 PERCENT HIGHER THAN AT THE SURFACE…AND WINDS 80-100 STORIES UP COULD BE ABOUT 30 PERCENT HIGHER THAN AT THE SURFACE. This entry was posted in water, weather and tagged flooding, forecast, hurricane, Irene, landfall, long island, new jersey, New York City, spring tide, storm, storm surge, tide, tropical. Bookmark the permalink.